I had planned some more substantive posts, but Iris' school performance, subsequent illness, and then my illness wiped out my last week and a half. Instead, I offer a fluffy pattern review of Butterick 5816 View B. 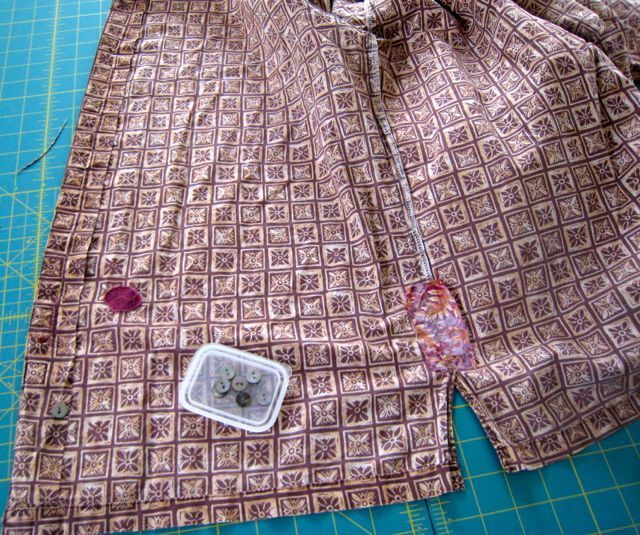 The pattern envelope and the Butterick website does not offer a photograph of the blouse--generally a bad sign. They may not have even tested the pattern before publishing it. I didn't intend to purchase a pattern to be their beta tester; I originally wanted to make view D, which wouldn't have worked for this fabric. This has a lot of collar, even when doubled over and twisted. 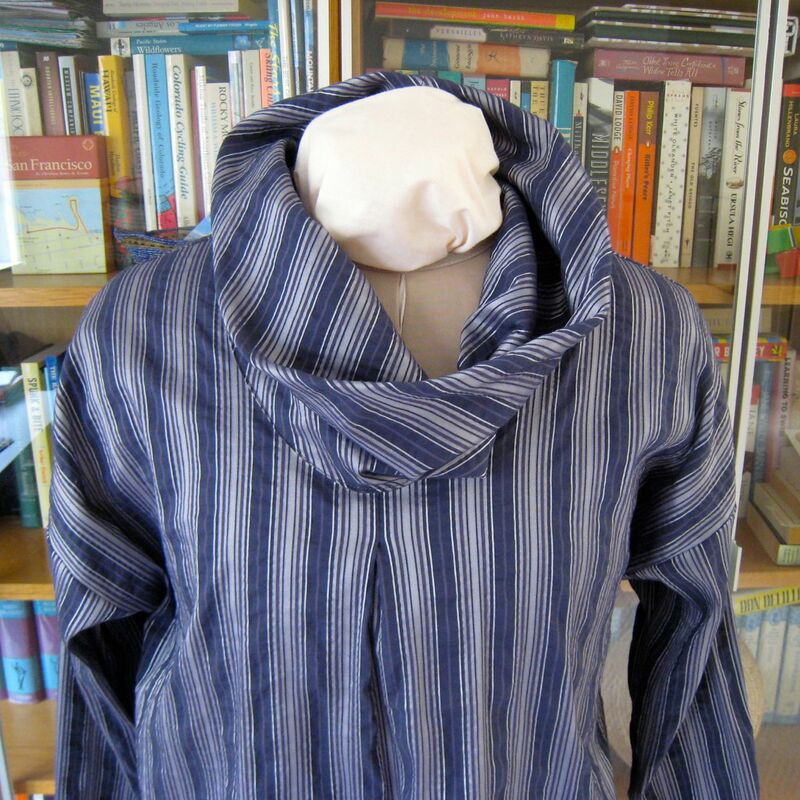 The collar looks more tailored and stiff when folded over without a twist. 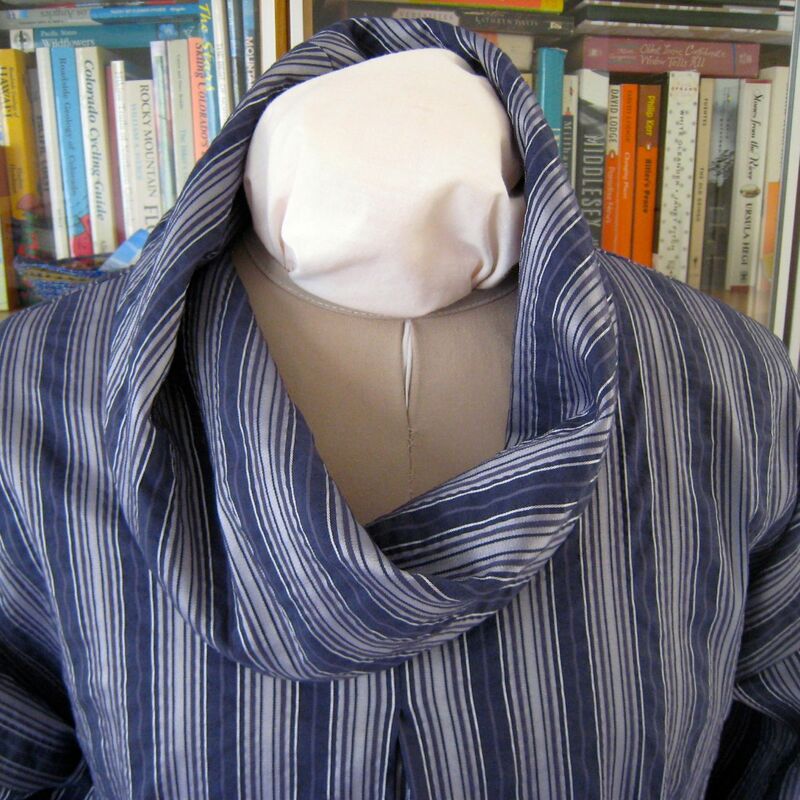 If you have a loooooong neck, you can wear the cowl without folding it over. 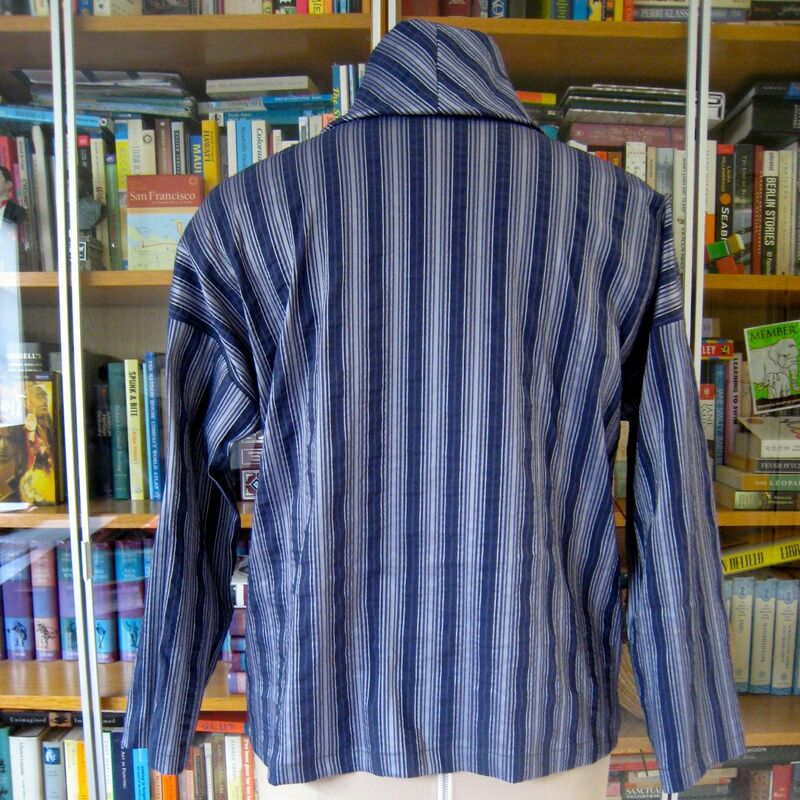 Notice that the stripes don't match on the back neck seam. I couldn't be bothered because I wasn't sure if I would like the finished product and thought this was just a wearable muslin. It turns out, this is a fun, easy and very pretty blouse. I think it will be worn quite often. The pattern pleasantly surprised me with its engineering. The bias cowl is lozenge-shaped instead of rectangular. That allows it to lay more gracefully. All the pattern pieces match up exactly the way they should. My only gripe is that the pattern is drafted with straight shoulder seams. I am not shaped like that. I took a tip from the Burda draft and curved the shoulder seams down about 1/4" toward the neck edge to hug the indentation by my clavicle. I purchased the mystery fabric at SAS. A flame test revealed that it was either acetate or triacetate. It has a lovely crinkled pique finish with satin and twill woven stripes. It can fray like crazy, so I was careful when handling it. The cowl seams are enclosed. The shoulder seams are flat felled. The sleeve and side seams are serged with gray thread, and the hems are turned under twice. I sewed a size Medium (12-14), which is my size according to their measurement charts. I usually shorten pattern sleeves by 1/2", but needed to shorten this one by 2.5". 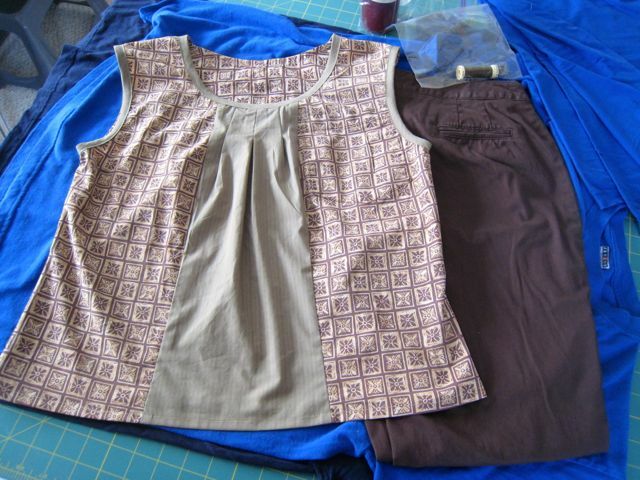 Although the long-sleeved version of this blouse is shown in the longer (body) length, I cut it out in the shorter length. I raised the center front neckline by 2", narrowed the neckline 1/4" on each side and redrafted to a smooth neckline curve. 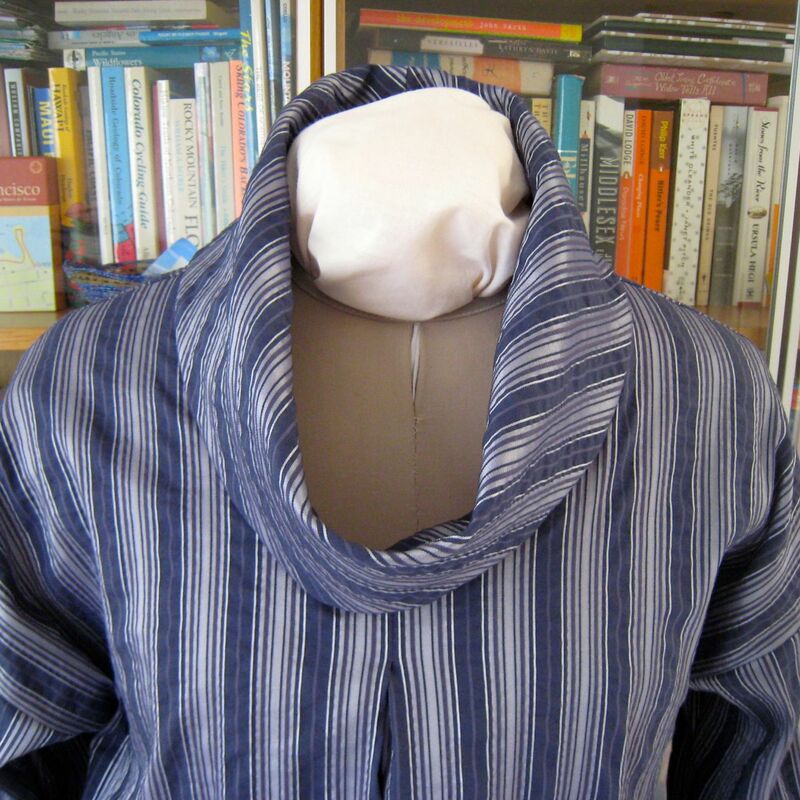 The neck circumference at the seam line was 28" (instead of the original 32"), which is the circumference of the XS cowl piece. 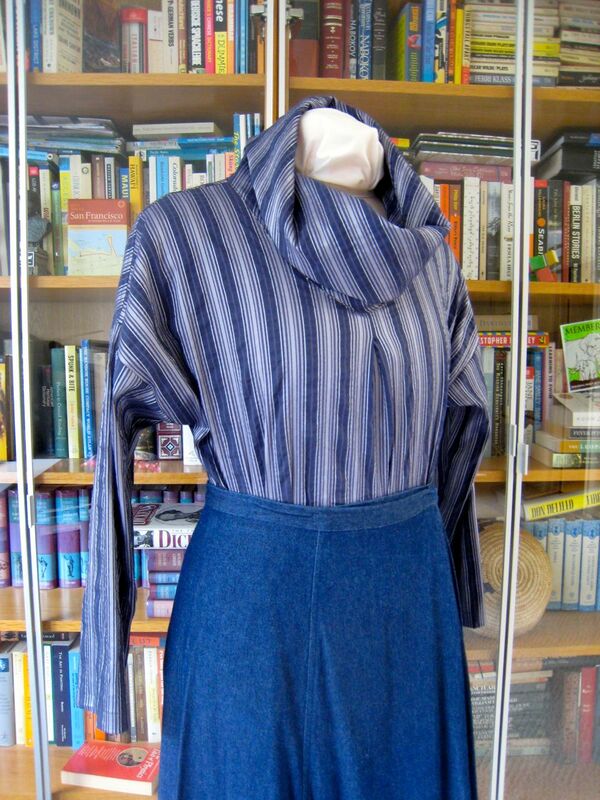 BTW, I styled it with a denim wrap skirt made with Vogue 9414. It's OOP, but Lanetz Living has two copies of it for sale. I first made this skirt in linen and you can see it on me here. 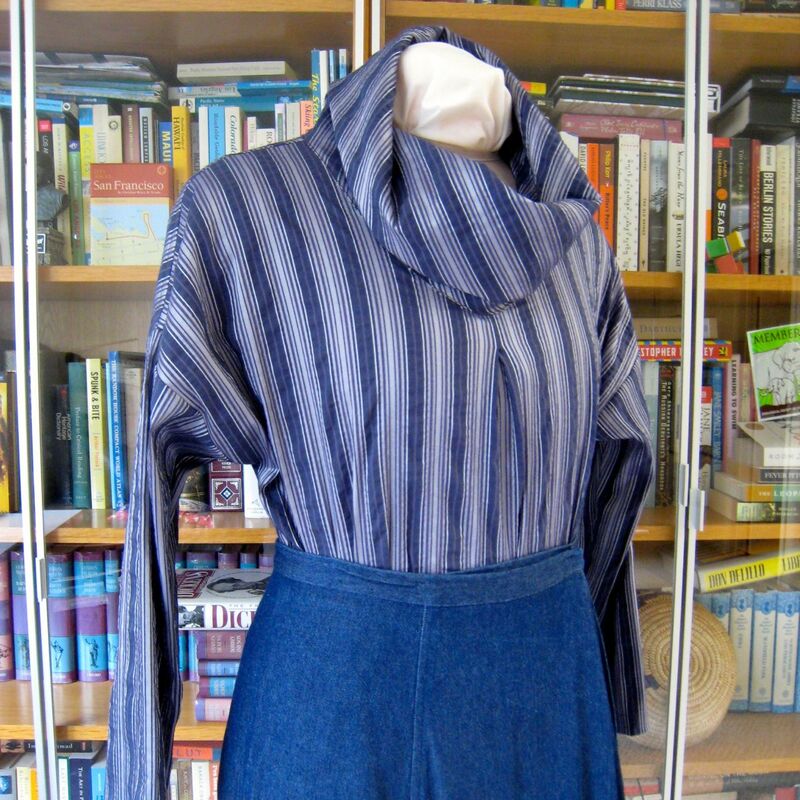 I also found the linen and denim for the two skirts at SAS. People often ask me where to buy fabric. It's difficult now that all of the full-service apparel fabric stores in the south bay have closed. In the last decade or so, we've lost TreadleArt, Florence Fabrics and the Cotton Shop. I can't stand the stuff they sell at Joann's as apparel fabric. These days, I find my apparel fabrics locally at odd jobbers like SAS Fabrics and Trash for Teaching. Both are hit and miss because they stock leftovers from area apparel manufacturers. They have what they have and it might not be what you need at that point in time. But, at prices ranging from $1-$6 per pound for the odd-sized flat folds, or $1-6/yard (for fabrics on rolls) I buy what I like even if I don't have an immediate use for it. I would be remiss if I didn't mention Momen, a quilt shop with a distinctly Japanese flavor in old Torrance. They sell Japanese-made fabrics for far less than they sell for in Japan. The owners have great relationships with US and Japanese manufacturers and their selection and prices for top-quality fabrics are unbeatable. But, sadly, most of it is for quilting or home dec. I keep a shopping list and order interfacing once a year from Fashion Sewing Supply. I used to order thread and notions annually from Atlanta Thread and Supply, now part of WAWAK Sewing Supplies. Has anyone used WAWAK and want to share their customer service experience? Bad Dad and I wished for a bookstore on Artesia and two opened up--one for new books and one for used ones. The Cotton Shop and Luella's Quilt Basket closed down due to their owners' retirements, but a former Luella's employee opened up Nina's Quilt Barn. There is an empty storefront on Artesia boulevard that would be perfect for an apparel fabric store with classrooms. It even shares a parking lot with a sewing and vacuum shop. Someone really needs to open up a fabric store there. How hard do I have to wish? Pattern review for Butterick 5816. Shopping is not much fun for petite brunettes who live in Boulder, a small town full of blonde giantesses. Nothing fits. The colors don't suit. And the styles are geared towards college-aged kids. What's a busy forty-something mother supposed to wear? While closet cleaning, I found one of Bad Dad's beloved shirt had developed tears in prominent places. It's more than 13 years old and had already been patched twice. The fabric may not last much longer, but I decided to make a top out of it just because the fabric is too wonderful to toss out. 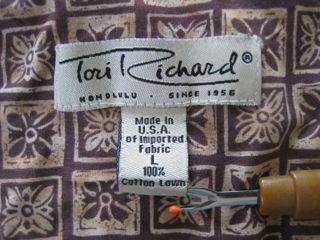 Tori Richard designs their prints and produces their cotton lawn in Japan, and then sews the shirts up in Honolulu. I was surprised to read on their website that these are printed (instead of batik) fabrics. The detail on the reverse side is almost as sharp as the printing on the "right" side. That takes extra care, time and specialized equipment. I used Simplicity 2938 again, but shortened the torso slightly. I picked up the sage green cotton stripe at SAS last year. The brown pants were an ill-fated attempt on my part to try the new ankle pant silhouette. Note to self: there is a reason why they are shown modeled by size 0 giantesses on stilts. Hopefully, they should fit her perfectly without hemming. 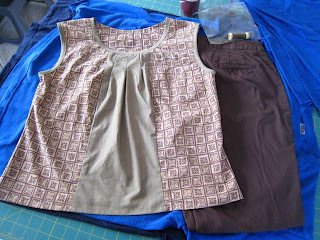 If the top fits, then I have another shirt and contrast fabric combo waiting to be refashioned for her. The care package weighed 9 pounds (with organic strawberry jam!) 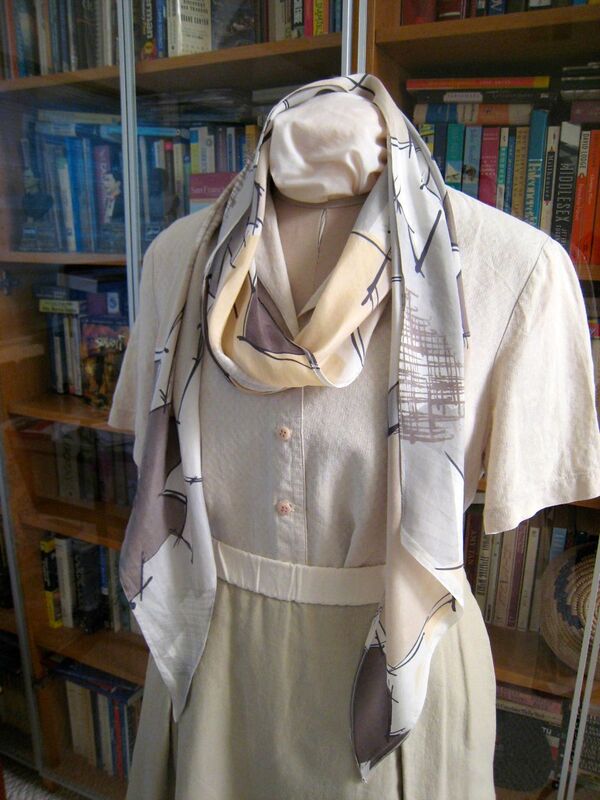 and included 2 dresses, 2 pairs of pants, two blouses, 2 knit shirts and 3 cotton sweaters. Everything was recycled content so she need suffer no enviro-guilt. She should be set for spring/summer without shopping. Bad Dad, Little Hunting Creek and I are all enrolled in CB22x The Ancient Greek Hero. 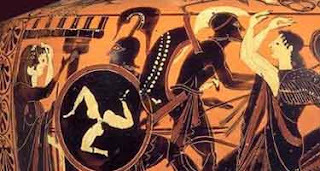 We'll take a quick tour of the entire Iliad in 2.5 weeks with close readings of selected passages. 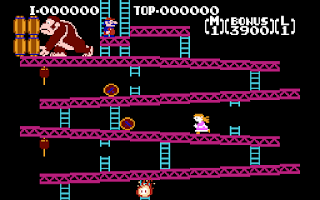 Then we will move on to the Odyssey and beyond. Students are divided up into sections of ~1000 participants. I'm in Antigone. Bad Dad is in Iphigenia. Bad Dad mentions that things don't end well for either character. Mika is a game developer. 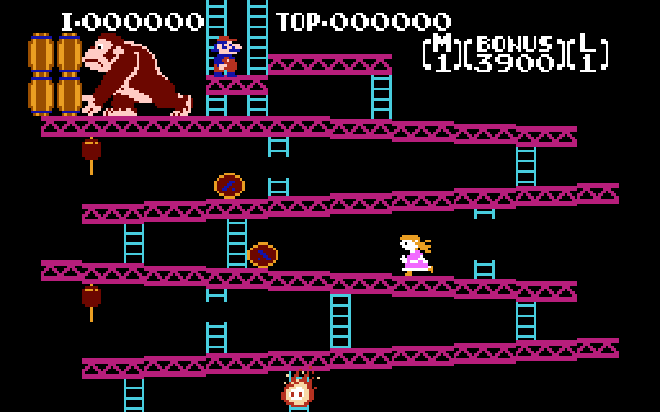 With some help from friends, he was able to hack into Donkey Kong so that his daughter can play as Pauline to save Mario, or Mario can save Pauline (as in the original). The hack went viral in social media. But, the responses surprised him. There are so many things I want to say about this. But, I have a busy day ahead of me and can't get back to this until the weekend. Discuss amongst yourself in the comments and I will do another write-up on Sunday. Watch the video and read the comments. Read Mike Mika's article in Wired. February ended nearly two weeks ago. What did you make in silk? In January, I lined a dress in this large floral silk. In February, I cut out a 12" bias strip the full width of this fabric to make a long bias scarf. This may not look like much, but cutting and hemming a long length of bias-cut light-weight silk is not a trivial project. I plan to wear it with a linen shirt purchased at a thrift shop. The label says Eileen Fisher, made in the USA of Irish linen. It landed in the shop because of badly frayed buttonholes. A spool of buttonhole twist and the hand-worked buttonhole method that my mother taught me when I was in middle school, and I have a new blouse! I carefully pressed the long bias edges of the scarf to the wrong side, sewed close to the edge, turned it under and stitched it again. Bias and lightweight silk. Easier said then done. 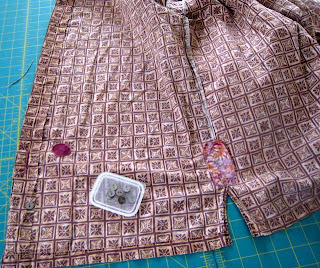 But it is done and it is exactly what this blouse needs. Ever notice that Eileen Fisher clothes and accessories are always solids? While they use texture effectively, they .never. use prints. 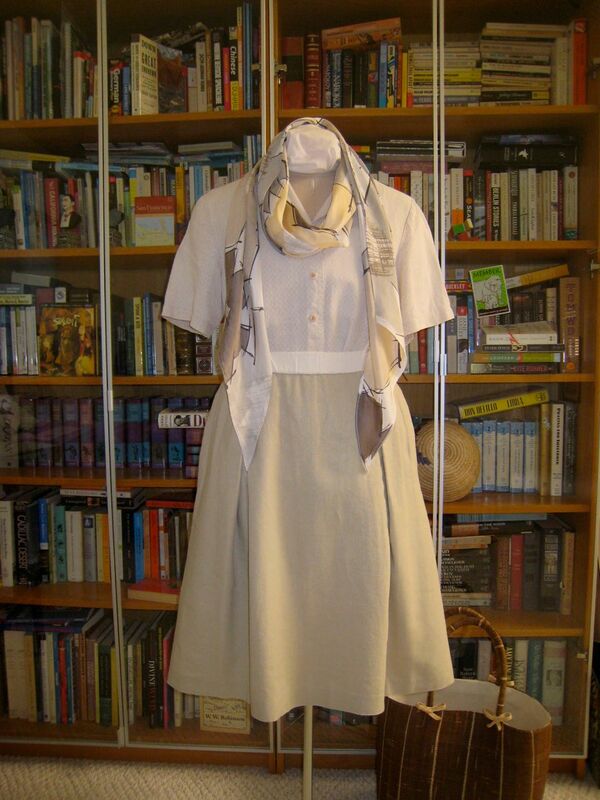 A metallzed linen skirt lined in Bemberg rayon, Vogue 9951, completes this Spring outfit. In March, we're sewing with a border print. While shopping at SAS with Rose last weekend, a black cotton voile with white eyelet border embroidery came home with me. Perhaps I should make another Burda 2011-02-101. I finished Cerisara more than a year ago and never blogged about it or updated the entry in Ravelry. I dropped by Twist Yarns in Manhattan Beach yesterday, in the hopes that KIP, knitting in public, would help me find the mojo to finish a Knit Swirl cardigan that had became very large and unwieldy. It worked. It also gave me a chance to visit my cardigan, which is on display in the front of the store. Twist Yarns is open Wednesday-Saturday and the first Sunday of every month. That means you can stroke the Malabrigo silky merino (50/50 silk/merino) cardigan from 12-4 today. Ravelled here (with construction details of interest to knitters). @Steph A Yes, the sweater feels lovely, but it clings to my hips a bit. I need to line the bottom half of the sweater with some silk habutai to prevent the cling. The truth is, I've made so many lovely clothes over the years, I need to clean out my closet. I sent two bags to Goodwill and gave 4 sweaters to an Australian blogger that visited me over the holidays. I also set aside a bag of clothes for a friend in Boulder. Baby steps. I wonder if, at PR weekend SF, we can hold a fabric and book swap one evening? Hmm, that might happen if someone organized it. "So simple your grandmother can use it." drives me into a conniption. Ha, many grandmothers know more nuts and bolts about how technology worked in their day than their grandchildren, because they could actually see the mechanical working parts. Moreover, my generation (today's mothers) is more likely to know computer programming than our technology-consuming children. Pennamite forwarded a linke to the Grandma GOT STEM blog. From Why this blog? I would like to counter the implication that grannies (gender + maternity + age) might not easily pick up on technical/theoretical ideas. As a start, I’m planning a public awareness / art project using grandmothers’ pictures+names+connections to STEM. This blog is where I’ll collect the info. Please forward the call below (and answer it if you know/are a STEM granny!). So far I have had some really nice responses, including people who have said “I think my Mother/Grandmother did something with STEM, but I never really talked with her about it. I’ll get in touch with her and get back to you.” I’ve also heard from a number of enthusiastic grandmothers directly. I hope you pass the link on. I was particularly fascinated by the autobiography of grandmother Arlette Lambert Porter. She managed to parlay a degree in pure mathematics into a wide-ranging career in computer programming in many industries. She's 70 years old, still working, and a proud 3-time grandmother. I have evolved with the technology and progressed from programmer to systems analyst to director of information systems for my branch of this world-wide company. The advent of the internet and web-based networking allow me to now sit at my desk and transfer data all around the world in a matter of seconds. I have evolved with the technology and progressed from programmer to systems analyst to director of information systems for my branch of this world-wide company. It is not at all unusual for me to communicate with people from Brazil, Scotland, China, Mexico and Canada, in addition to people throughout the US on any given day.